Lutes are generally thought to have originated in Mesopotamia around 2000 BC, from which they traveled both west to Europe and east to Asia. Many different designs and variations on the basic design have existed through the ages. 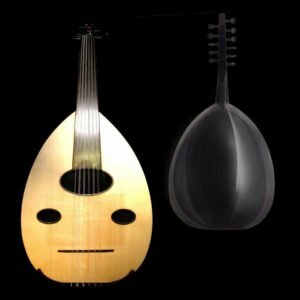 The long lute, having a neck longer than the body, which date back to around 2000 BC, has modern descendents in several countries (e.g., the tar of Turkey and Iran, the sitar and vina of India, the bouzouki of Greece, the tambura of India and Yugoslavia, and the ruan of China). The short lute, which dates from about 800 BC, is the ancestor of the European lute as well as many other plucked string instruments around the world. The European lute first appeared in the thirteenth century, deriving its name from the Arabic phrase “al-oud,” which means “made of wood.” The lute is one of the most attractive and delicate of all Renaissance musical instruments. Its principal characteristics are an exceptional lightness of construction, a rounded back con- structed from a number of ribs, and a peg-box set at an angle to the fingerboard. Instruments of the sixteenth century generally had eleven strings in six courses (all but the uppermost consisting of two unison strings), which might be tuned to A2, D3, G3, B3, E4, and A4, although the tuning was often changed to fit the music being played. Sometimes the lower three courses were tuned in octaves. Bass: seven courses, string length 78 cm; Octave bass: seven courses, string length 95 cm. The pear-shaped body of the lute is fabricated by gluing together a number (from 9 up to as many as 37) of thin wooden ribs. The table or sound board is usually fabricated from spruce, 2.5–3.0 mm thick, although other woods, such as cedar and cypress, have also been used. Only a few studies on the acoustical behavior of lutes have been reported. Firth (1977) measured the input admittance (driving point mobility) at the treble end of the bridge and the radiated sound level 1 m away. Firth associates the peak at 132 Hz with the Helmholtz air mode and the peaks at 304, 395, and 602 Hz with resonances in the top plate. Figure 3.27 illustrates five such resonances and also shows how the positions of the nodal lines are related to the locations of the bars. The resonances at 515 and 652 Hz are not excited to any extent by a force applied to the bridge because they have nodes very close to the bridge. are stretched between a raised nut and a violin-like bridge The long neck (73.5–84 cm), which is typically made of ebony or juniper, hosts 5,258 movable frets of gut or nylon. The tanbur has seven strings, six of them grouped in pairs, and the lowest string, tuned to A1, is single. The pairs are tuned to A2, D2, and again A2 (or alternatively A2, E2,and A2). The impulse response of the tanbur body for three orthogonal force impulses applied to bridge are shown in Fig. 3.29. These responses include the effects of driving point admittance of the bridge, the vibration of body and neck, and the directivity of the radiation pattern. These responses were recorded in an anechoic room (Erkut et al. 1999). A modal shape represents the motion of the guitar in a normal mode of vibration. Optical methods give the best spatial resolution of a given operational deflection shape (ODS), which in many cases closely resembles a normal mode. Optical methods include holographic interferometry, speckle-pattern interferometry, and scanning laser vibrometry. sense its motion. The force hammer is moved from point to point in a grid, and a frequency response function (FRF) determined for each point of excitation. The resulting FRFs are processed by a computer and the modal shape is determined by use of a curve-fitting program. A player can alter the tone of a guitar by adjusting the angle through which the string is plucked. Not only do forces parallel and perpendicular to the bridge excite different sets of resonances, but they result in tones that have different decay rates, as shown in Fig. 3.13. When the string is plucked perpendicular to the top plate, a strong but rapidly decaying tone is obtained. When the string is plucked parallel to the plate, on the other hand, a weaker but longer tone results. Thus, a guitar tone can be regarded as having a compound decay rate, as shown in Fig. 3.13 (bottom). The spectra of the initial and final parts of the tone vary substantially, as do the decay rates. regard. However, the player can change the balance between horizontal and vertical string motion by varying the angle of the fingertip (Taylor 1978). shows the sound spectrum one meter in front of a Martin D-28 folk guitar in an anechoic room when a sinusoidal force of 0.15 N is applied to the treble side of the bridge. Also shown is the mechanical frequency response curve (acceleration level versus frequency). Note that most of the mechanical resonances result in peaks in the radiated sound, but that the strong resonances around 376 and 436 Hz (which represent “seesaw” motion; see Fig. 3.11) do not radiate strongly in this direction. The mode at 102 Hz radiates efficiently through the sound hole. Figure 3.16 shows polar sound radiation patterns in an anechoic room for the modes at 102, 204, 376, and 436 Hz. The modes at 102 and 204 Hz radiate quite efficiently in all directions, as would be expected in view of the mode shapes (see Fig. 3.7). Radiation at 376 Hz, however, shows a dipole character, and at 436 Hz a strong quadruple character is apparent, as expected from Fig. 3.7 (Popp and Rossing 1986). The output spectrum of a guitar may be calculated by multiplying the bridge force spectrum by the frequency response function of the guitar body. This is greatly complicated, however, by the rapid change in the force spectrum with the time after the pluck (see Fig.3.13). Caldersmith and Jansson (1980) measured the initial sound level and the rate of sound decay for played notes on guitars of high and medium quality. They found that both the initial sound level and the rate of decay replicate the frequency response curve of a guitar, as shown in Fig. 3.17. At strong resonances, however, the initial levels are slightly lower, and the levels decay faster than predicted by the frequency response curves. Rating the sound quality of classical guitars and how the quality depends on design and construction details have been studied by several investigators. According to Jansson (2002), most guitar players feel that tonal strength or carrying power is the most important single quality criterion, with tone length and timbre being the second most important. In the previous section, we mentioned how the initial sound level and rate of sound decay depends upon the resonances of a guitar body. Tones from recorded music were analyzed in the form of long time average spectra (LTAS), and it was found that better guitars have a higher level up to 3,000 Hz. Comparing two guitars, it was found that the less good guitars tended to have a lower level below 2,000 Hz and above 400 Hz (Jansson 2002). 8. The peak level of the second resonance (around 200 Hz). Meyer found that using fewer struts, varying their spacing, adding transverse bracing and reducing the size of the bridge, to have desirable effects (Meyer 1983). He experimented with several different bridge shapes and found that a bridge without “wings” gave the best result. 2. Top plate thickness 3. Cross bars or struts. So-called “frame” guitar designs have a rigid waist bar to inhibit leakage of vibrational energy from the lower bout to the upper bout and other parts of the guitar. The bridge has a marked stiffening effect on the top plane, and thus affects the vibrations. For a heavy bridge the frequency of the first top plate resonance may decrease, the mass giving a larger contribution than the stiffness increase. Hand- made Spanish bridges tend to be considerably lighter and less rigid than factory- made bridges. For low frequencies the mass increase may dominate, but at higher frequencies the stiffening effect dominates (Jansson 2002). was 2.9 mm, and the struts were 14 mm high and 5 mm wide. Their calculations showed that the cross struts gave a large influence at least for the low resonances. A reduction in strut height also results in a large influence on the resonance frequen- cies. Reduction in top plate thickness, especially thinning along the edge, has the greatest effect of all. Richardson and his students have also found that reducing the effective mass has a great effect on radiation of high-frequency sound, even more than tuning the mode frequencies (Richardson 1998). The effective mass is difficult to control, however, after the choice of materials and general design has been made. Of primary importance is the effective mass of the fundamental sound board mode. Australian luthier Greg Smallman, who builds guitars for John Williams, has enjoyed considerable success by using lightweight top plates supported by a lattice of braces, the heights of which are tapered away from the bridge in all directions, as shown in Fig. 3.18. Smallman generally uses struts of carbon-fiber-epoxy expoxied to balsa wood (typically 3 mm wide and 8 mm high at their tallest point) in order to achieve high stiffness-to-mass ratio and hence high-resonance frequencies or “lightness” (Caldersmith and Williams 1986). Although many classical guitars are symmetrical around their center plane, a number of luthiers (e.g., Hauser in Germany and Ramirez in Spain, Schneider and Eban in the United States) have had considerable success by introducing varying degrees of asymmetry into their designs. Most asymmetric guitars have shorter but thicker struts on the treble side, thus making the plate stiffer. Three such top plate designs are shown in Fig. 3.19. The very asymmetric design in Fig. 3.19c was proposed by Kasha (1974) and developed by luthiers Richard Schneider, Gila Eban, and others. It has a split asymmetric bridge (outlined by the dashed line) and closely spaced struts of varying length. A waist bar (WB) bridges the two long struts and the sound hole liner. Despite its asymmetry the vibrational modal shapes, at least at low frequency, are quite similar to other good classical guitars, as shown in the holographic interfero- grams in Fig. 3.20. The particular guitar in this modal study had a one-piece bridge and radial bracing in the back plate as well as the top plate. Other luthiers have had considerable success with radial bracing. Australian luthier Simon Marty uses a radial bracing of balsa or cedar reinforced with carbon fiber. Trevor Gore has had success using falcate bracing with curved braces of balsa and carbon fiber. and a bass guitar in addition to the conventional guitar – which becomes the tenor of the family – has been played and recorded extensively by the Australian quartet Guitar Trek (Caldersmith 1995). Caldersmith’s guitar families include carefully scaled instruments, the tunings and resonances of which are translated up and down by musical fourths and fifths, in much the same way as the Hutchins–Schelleng violin octet (see Chap. 18). Calder- smith’s bass guitar is a four-string instrument tuned the same as the string bass and the electric bass (E1, A1, D2, G2), an octave below the four lowest strings of the standard guitar. The baritone is a six-string instrument tuned a musical fifth below the standard, while the treble is tuned a musical fourth above the standard, being then an octave above the baritone. Caldersmith uses an internal frame, but a graded rectangular lattice instead of the diagonal lattice (see Fig. 3.21). The Australian Guitar Quartet is shown in Fig. 3.22. Traditionally guitars have top plates of spruce or redwood with backs and ribs of rosewood or some comparable hardwood. Partly because traditional woods are sometimes in short supply, luthiers have experimented with a variety of other woods, such as cedar, pine, mahogany, ash, elder, and maple. Bowls of fiberglass, used to replace the wooden back and sides of guitars, were developed by the Kaman company in 1966; their Ovation guitars have become popular, partly because of their great durability. One of the first successful attempts to build a guitar mostly of synthetic materials was described by Haines et al. (1975). The body of this instrument, built to the dimensions of a Martin folk guitar, used composite sandwich plates with graphite- epoxy facings around a cardboard core. In listening tests, the guitar of synthetic material was judged equal to the wood standard for playing scales, but inferior for playing chords. In France, Charles Besnainou and his colleagues have constructed lutes, violins, violas, cellos, double basses, and harpsichords, as well as guitars, using synthetic materials (Besnainou 1995). Most of our discussion has been centered on classical guitars, with occasional compar- ison to the steel-string American folk (flat top) guitar. There are several other types of acoustic guitars in use throughout the world, including flamenco, archtop, 12-string, jazz, resonator, etc. Portuguese guitars will be discussed in Chap. 4. Some Asian plucked string instruments of the lute family will be discussed in Chap. 11. The gypsy guitar, known in France as the manouche guitar, gained popularity in the late 1920s. Played by Django Reinhardt throughout his career, the instrument has seen a revival in interest. 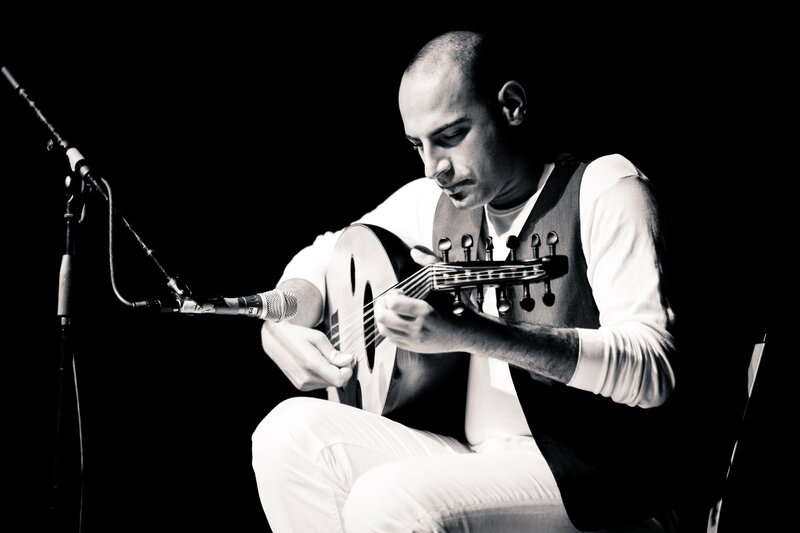 The community of gypsy jazz players today is a small, but growing one, and the original Selmer–Maccaferri guitars are highly valued and widely copied. Its low-gauge strings offer its player a brighter, more metallic tone, with an ease for creating a very distinct vibrato (Lee et al. 2007). C. Besnainou (1995). “From wood mechanical measurements to composite materials for musical instruments: New technology for instrument makers.” MRS Bull. 20(3), 34–36. R. R. Boullosa (1981). “The use of transient excitation for guitar frequency response testing.” Catgut Acoust. Soc. Newsl. 36, 17. G. Caldersmith (1995). “Designing a guitar family.” Appl. Acoust. 46, 3–17. Royal Institute of Technology (KTH), Stockholm, pp. 50–61. G. Caldersmith and J. Williams (1986). “Meet Greg Smallman.” Am. Lutherie 8, 30–34. J. Acoust. Soc. Am. 68, 758–766. 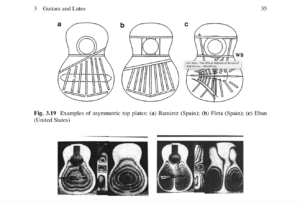 Turkish long-necked lute.” Proceedings 6th International Congress on Sound and Vibration.